Organic Icelandic Blueberry Sea Salt Flakes are light and crisp with a bright fruit flavor. 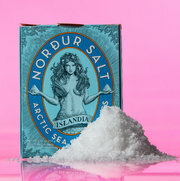 The blueberry salt process starts with our organic Arctic sea salt flakes that are made using geothermal energy. (See more of the story, below). The flakes are then infused with wild Icelandic blueberries. Try on seafood, chicken, grains, salad, fruit, chocolate or caramel sauces, or other desserts. Try also on a cocktail, tea, or lemonade.